Rupert Clamp's art project for the Gatherums and Springside was unveiled on Sunday the 8th of December. To celebrate the unveiling there was a hog roast which took place in a marquee in Springside. The art project involves a number of signs, originally intended to be 13, positioned around Louth, all of which point to Springside. 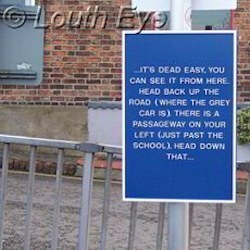 The text for the signs was taken from the directions that local people gave to the artist when he pretended to be "Lost in Louth". On the day only 11 of the plaques, which are blue and white to mimic the heritage plaques, were erected. One that was due to be put up in New Street was not erected due to a failure to obtain planning permission in time. 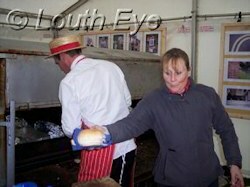 As well as a hog roast, the tent featured a display of some of the photographs that people took from around Louth. These were taken by people who took part in a workshop that formed part of the project. 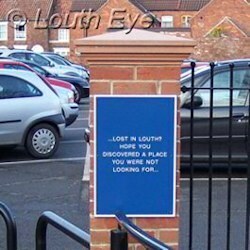 Maps, leaflets and reusable shopping bags were distributed to promote Lost in Louth. Lost in Louth is partially funded by Lincolnshire Creative Solutions Initiative. * This sign has been taken down for cleaning due to vandalism.